Morocco has set up a new Foundation for African Ulema (Islamic scholars) an institution destined to unify stands and strategies of African clerics against religious extremists. The North African Kingdom, a beacon of moderate Islam, is leading the war against religious fanatics and jihadists who want to impose their distorted version of Islam and tarnish Muslims’ image through their violent acts and bloodshed. 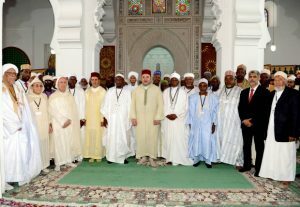 On Tuesday, King Mohammed VI chaired in Fez the installation ceremony of the Higher Council of the Foundation, meant to enhance cooperation and exchange of experiences between African Islamic clerics to enable them disseminate the true values of Islam, a religion of peace, tolerance and coexistence. Morocco has maintained special religious ties with Sub-Saharan African countries throughout centuries. There’s a strong religious link between Morocco and these African countries through the Tijaniyyah and other groups of Sufism, which have a long presence in this region. The Tijaniyyah religious group originated in Fez, Morocco’s spiritual capital, which still hosts hundreds of pilgrims from West Africa every year. For many Muslims across West Africa, influenced by Sufi strands of Islam, the Moroccan monarch is more than just another Head of state. He is the Commander of the Faithful (Amir Al Mumineen,) an Islamic title for a ruler with spiritual as well as political authority. These historical facts clearly empower King Mohammed VI of Morocco to set up this new Foundation for African Ulema for the exchange of experiences between African Islamic clerics to enable them disseminate the true values of Islamic religion which preaches peace, tolerance and coexistence. The opening of this new entity is part of an “integrated policy to promote constructive cooperation and respond to the requests from a number of sister African nations in the religious field,” stressed the Monarch. “This is another building block which further enhances our strategic policy designed to raise the level of political and economic cooperation between Morocco and a number of sister African nations in order to make it an effective, solidarity-based partnership, covering all sectors,” added the Sovereign. This new academic institution comes after King Mohammed VI launched in March 2015 a leading Institute that provides training to hundreds of imams of various nationalities from Africa and Europe. The center teaches Imams the precepts of a tolerant and non-violent form of Islam based on Maliki rite and teaches them how to fight extremism and religious radicalization through sound argumentation and dialogue. Written by: Jaber Ali on June 15, 2016. Posted by Jaber Ali on Jun 15 2016. Filed under Headlines, World News. You can follow any responses to this entry through the RSS 2.0. Both comments and pings are currently closed.